This episode features segments titled: A Little Bit of Learning, Off the Shelf, Yarn Lover at Large, and Ever-expanding Skill Set. The word welt comes to us from Middle English; the first known use was during the 15th century. At first, the term was used to refer to a strip (of leather) sewn into other material as a technique for reinforcement. Or, a tape or cord sewn into a seam. Later, the definition expanded to refer to raised or swollen bumps on the skin or other surface. 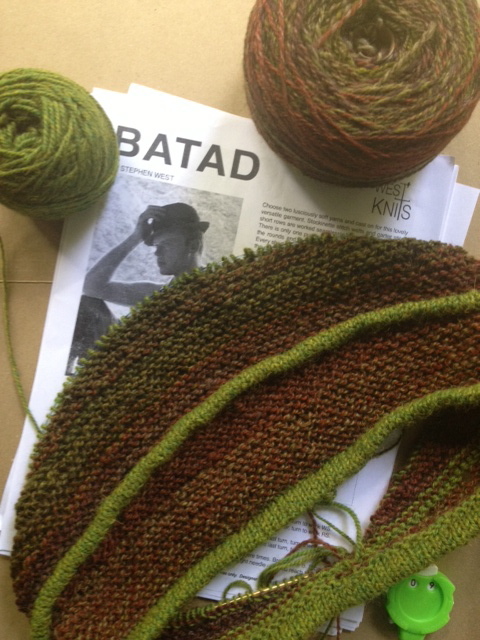 Stephen West’s Batad capelet includes bands of garter stitch with welts in stockinette stitch. The welts lend visual interest and texture to the garment, which is reminiscent of the rice terraces in the Ifugao region of the Phillipines. 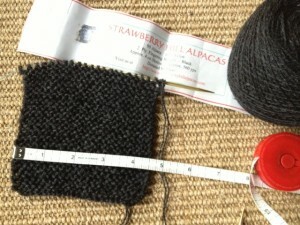 Though the welts in this pattern have been giving me fits, knitting them is teaching me how to read my knitting. 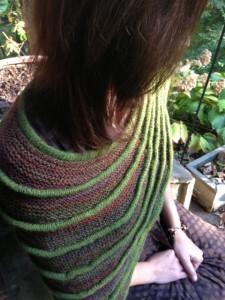 I’ve begun reading The Yarn Whisperer: My Unexpected Life in Knitting by Clara Parkes. 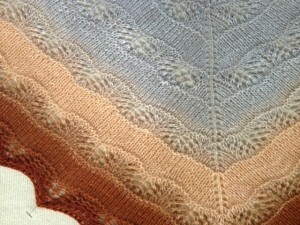 In this memoir, Parkes makes extensive use of metaphor and builds connections between her life events and techniques in knitting. 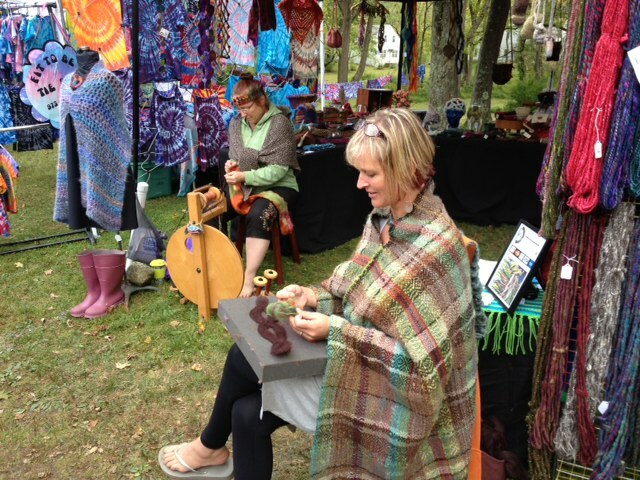 She is the creator and editor of The Knitter’s Review, a free, weekly, online magazine that reviews everything from knitting needles to retreats. Parkes’ writing is genuine and often beautiful. She knows and knows how to draw the reader in to her very personal story. 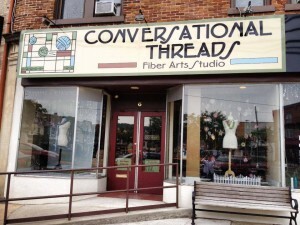 On Saturday, Samuel and I took an afternoon drive to Emmaus, PA, where we visited Conversational Threads, a yarn shop with great selection and a friendly staff. Sue coached me as I selected a yarn for the Hitchhiker shawl and Cindy wound all of my purchases while we had a nice Thai lunch down the street. 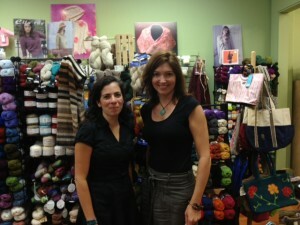 I was pleased to meet some folks from the shop, as I will be joining them for the bus tour to Rhinebeck in October. 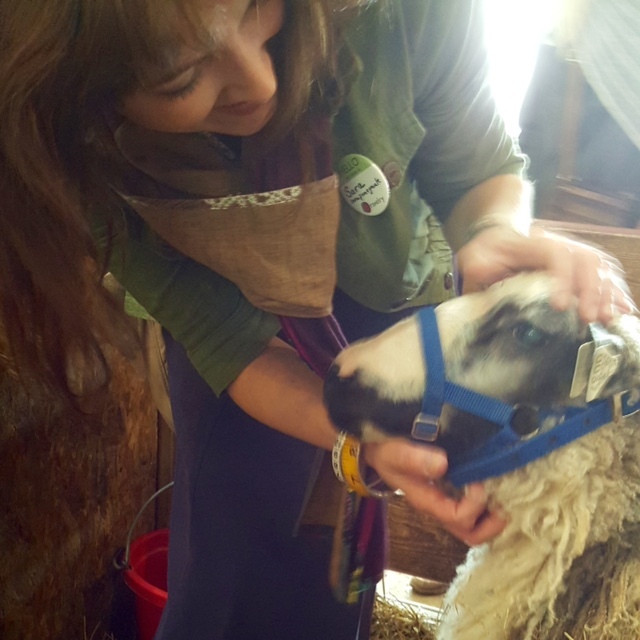 This will be my first time visiting the New York Sheep & Wool Festival, so podcast listeners will be hearing more about it in coming episodes. 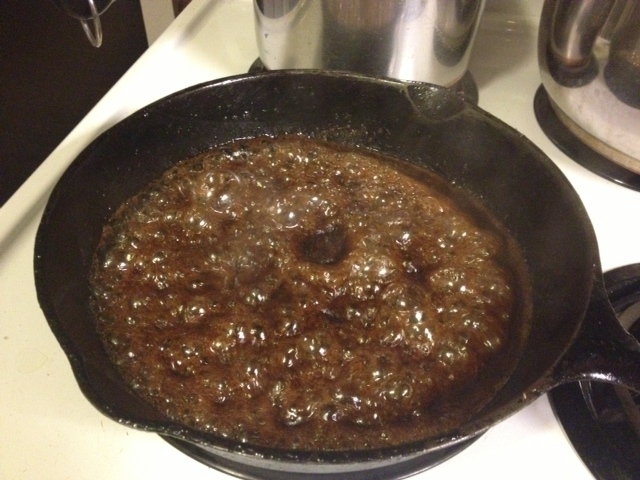 Combine equal parts brown sugar, balsamic vinegar (or soy sauce), and chili sauce or chili paste. Marinate pork chops or any other protein for at least 6 hours. Prepare a variety of seasonal vegetables for sautéing. Some excellent choices are sliced onions, corn kernels, bell peppers, broccoli, French cut string beans, and baby eggplant. Chop a big bunch of kale and place in a large bowl. Sauté the vegetables in a cast iron skillet or wok, using a small amount of olive oil or other fat, and a sprinkle of salt. Work in small batches, being careful not to overcrowd the pan. 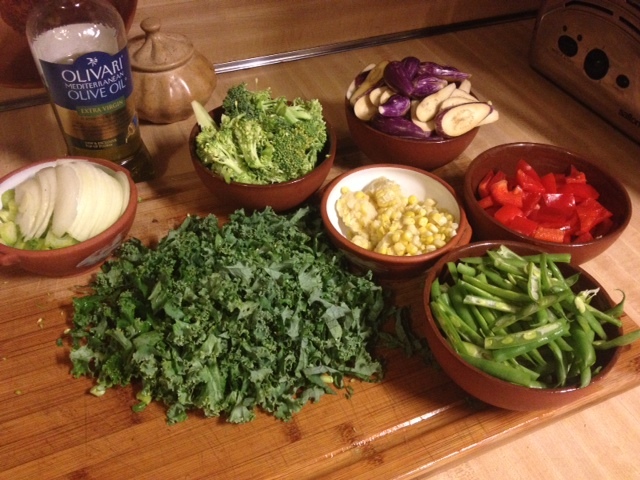 Empty sautéed vegetables into the bowl, on top of the kale. Keep the bowl covered so that the kale wilts and vegetables stay warm. Sear the pork chops on each side and cook through. Remove to a plate. Pour marinade into the pan and bring to a simmer. Allow the sauce to thicken slightly, then pour (when very hot) over the sautéed vegetables and kale. Toss to coat vegetables with a sweet and spicy sauce. 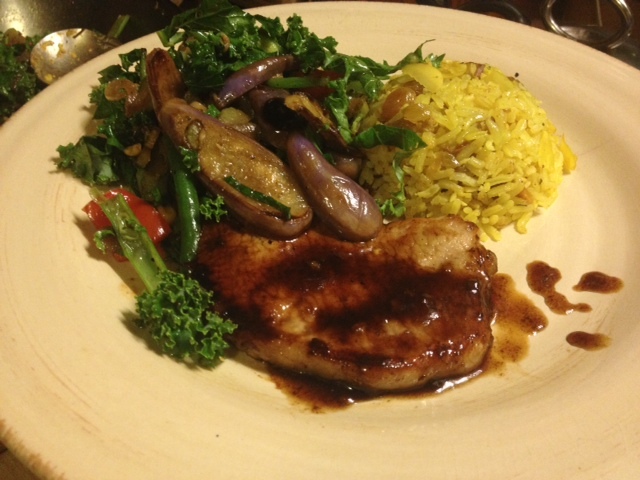 Serve pork and vegetables with a drizzle of remaining sauce and a side of rice pilaf. For more information on improvisational cooking, check out The Improvisational Cook by Sally Schneider. 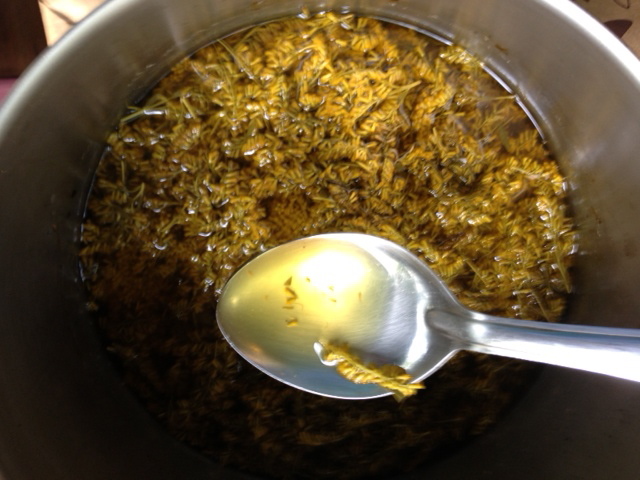 After harvesting five bunches of goldenrod from a nearby field, I snipped off all the blossoms into a bowl. After starting a hot fire in our Big Green Egg charcoal grill, I submerged the blossoms in one gallon of filtered water. The mixture came to a boil – which took awhile – then simmered for about an hour. 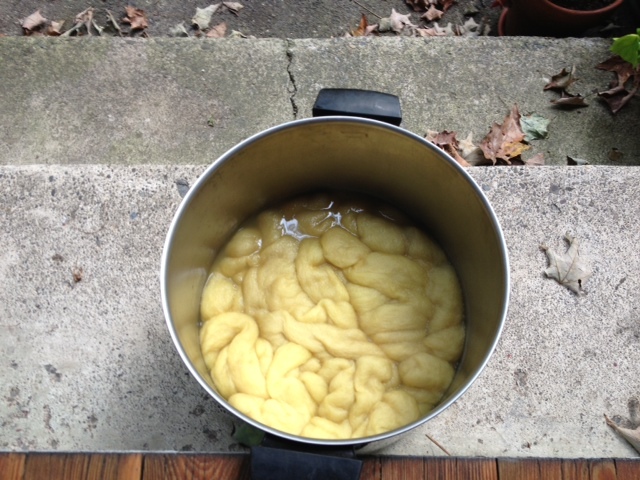 I let the liquid cool completely before straining, which is supposed to help the dye intensify in color. More on this next week, after I do a bit more research on mordants. 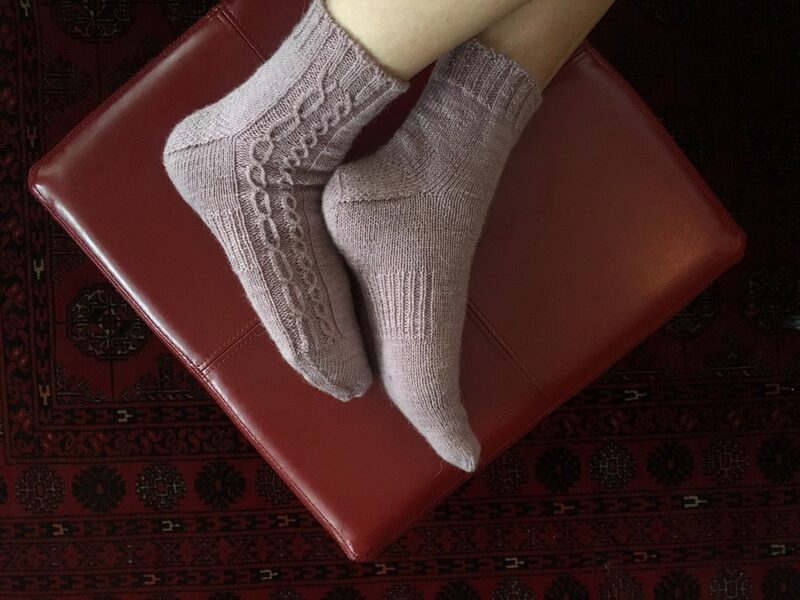 This week’s episode includes the following segments: Double Happiness, Yarn Lover at Large, The Back Porch and The Front Porch. Knitting and listening to jazz while sipping wine and nibbling cheese and sopressata on a sunny September afternoon is really the best life has to offer. This weekend, I took advantage of the time to work on a few projects while visiting with friends on the hill at the Delaware Water Gap Jazz Festival. 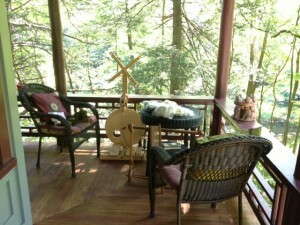 If you ever visit the Poconos the weekend after Labor Day, put the jazz fest on your list. 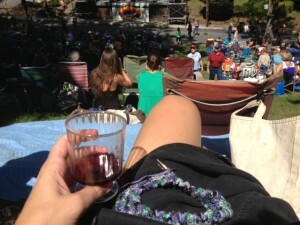 Here’s a photograph of the ambience, with my Sockhead Hat by Kelly McClure on my lap. I used the very stretchy cast on method in Tillybuddy’s YouTube tutorial. Laura Nelkin is well-known for her knitted and beaded jewelry designs. 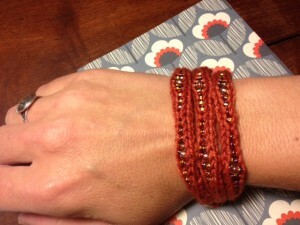 I was lucky to take her class on knitting the mudra cuff at my local yarn shop, Mountain Knits and Pearls in East Stroudsburg, PA. My skill set expanded as I learned to string beads before knitting, use double-pointed needles, and anchor I-cord onto a ringed clasp. 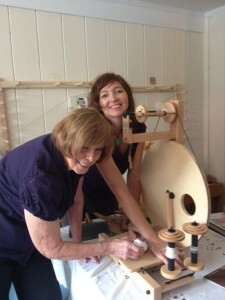 Check out Laura’s blog for more details about her whirlwind weekend of teaching in Pennsylvania. And if you ever get a chance to take one of her classes — sign up without hesitation. 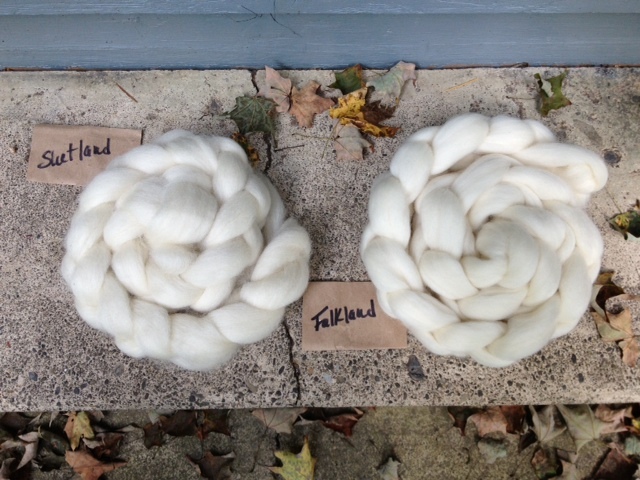 After two weeks of intentional spinning, I completed my handspun from mixed Blueface Leicester in the Country Cottage color. This fiber, from Beesybee, spun up very nicely into 447 yards of sport weight, 2-ply yarn for the Batad capelet by Stephen West. I had a lot of fun wringing the water out by hand — becoming a human salad spinner and spraying water all over the leaves of the hostas in my garden. This week’s episode features the following segments: Backstory, A Little Bit of Learning, Ever-expanding Skill Set, and Gratitude Journal. Since Episode 3, I have been working on intentional spinning. 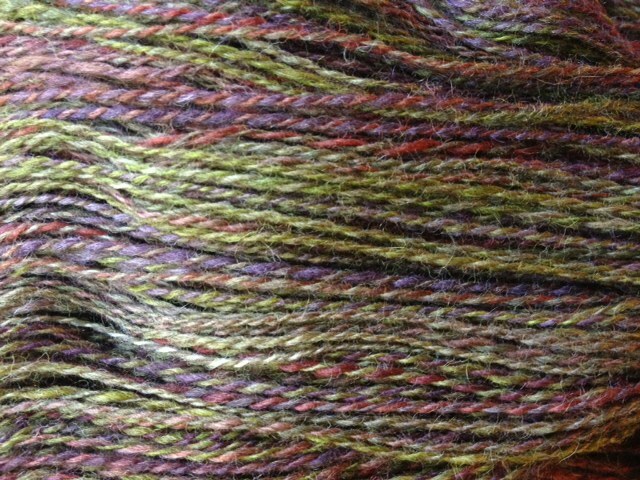 Here is half of my mixed BFL (bluefaced leicester) from Beesybee Fibers. Hopefully next week I can report on yardage. 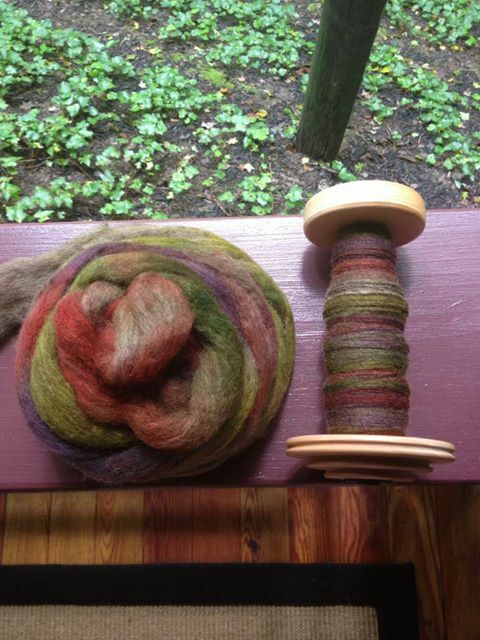 This fiber certainly has been a joy to spin. 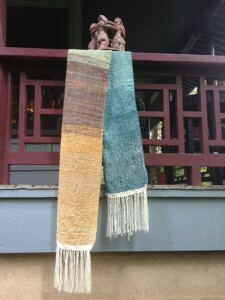 The colors are lovely earth tones. I’ve been spinning on the porch of Yin Hoo, watching the first orange leaves come floating down from the canopy. When I need a break from spinning, I look for the heron’s elegant form at the edge of the creek. We’ve seen as many as nine female Merganser swimming together and we have seen a few different bears walking along the path along the water’s edge. 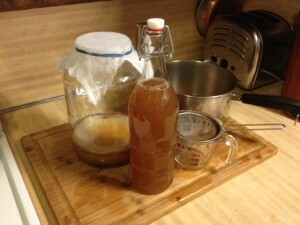 As promised in Episode 1, I’ve recorded a segment with my steps for making kombucha. In June, I received a scoby from my friend Gwen, and have been practicing all summer. Finally, I have a refreshing, effervescent, not-too-sweet fermented tea. Instructions for kombucha begin at twelve and a half minutes into the podcast. Begin by pouring off and straining kombucha. Always leave a small amount of tea in the fermentation container with the scoby (symbiotic colony of bacteria and yeast). I’ve been fermenting mine for 10 to 14 days before preparing a new batch. I store the brew in swing top bottles in the fridge. Be sure to use food-grade glass for both fermentation and storage. 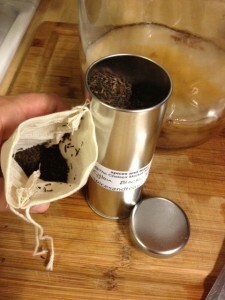 Make a new batch of tea by boiling one gallon of filtered water. Add about 3/4 cup of sugar and stir to dissolve. 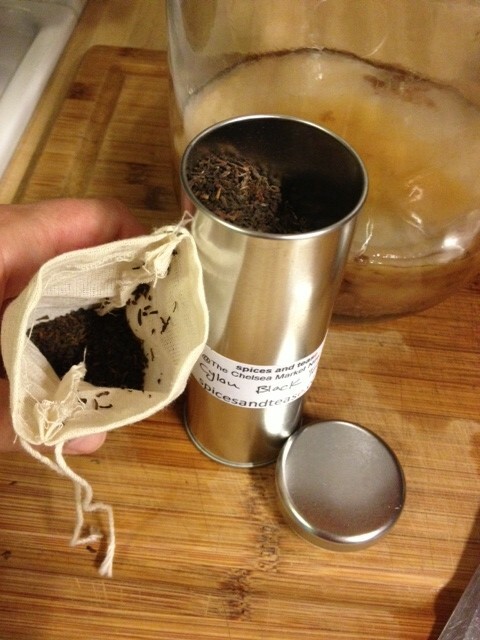 Remove the pan from heat and add 6-10 bags of black tea, or 6-10 tablespoons of loose black tea. Allow to steep for 5 minutes and then remove the tea bags or strain the tea. I put loose tea into a small cloth bag that acts as a tea bag. 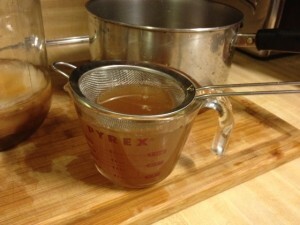 When tea has completely cooled, pour it into the container with the scoby. Sometimes this disturbs the scoby. I handle my scoby with clean hands. Keep the smooth, white surface of the scoby facing upwards. Cover the fermentation container with cheesecloth and store in a cool, dark place. Those who praise the benefits of kombucha usually mention its probiotic properties. I’d love to hear from you if you make kombucha at home or have a great recipe to try. This week’s episode features the following segments: Backstory, Yarn Lover at Large, The Back Porch, The Front Porch, and Double Happiness. 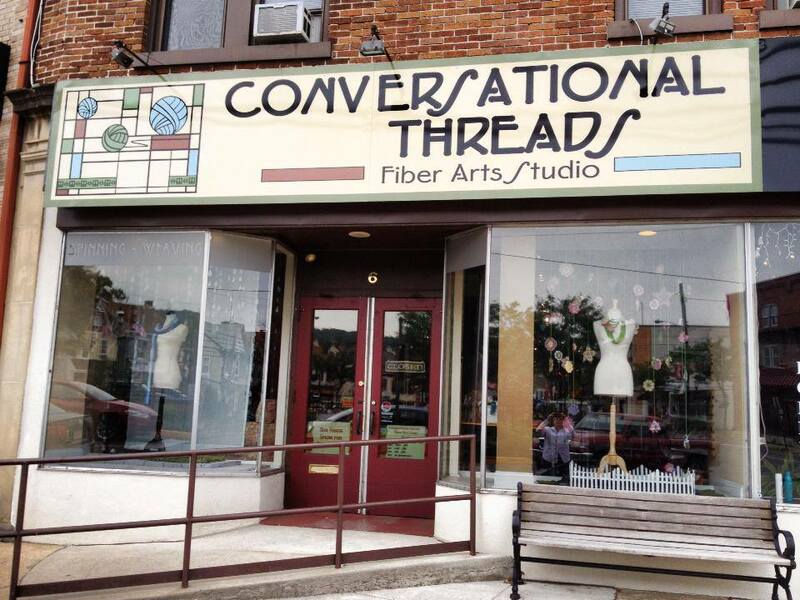 A little shop in Frenchtown has nice yarn selection and a wide variety of classes. Betty is a kind and patient teacher with a lot of expertise. If you visit The Spinnery, ask about Deadly Dudley; she’ll have a great story. Aside from some timely help with wheel maintenance (that’s my Louet on the operating table) I have two tips from the class to pass along. 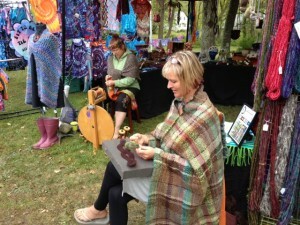 1) Knit with the yarn you spin. Now. 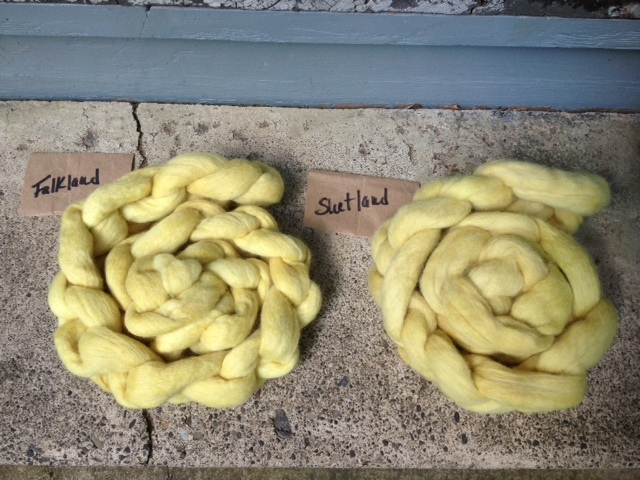 2) To improve as a spinner, select a project you want to knit, look up the yarn specifications, and spin for that project. Two finished projects this week. My Shaelyn shawl, designed by Leila Raabe, is blocking. Shifting to US size 6 needles resulted in a much nicer fabric. And I finally completed my second weaving project and took it off the loom. The yarn is handspun, made from Into the Whirled fibers made for a spin-along hosted by the Knitabulls podcast. The photo inspiration was Lavinia’s character on Downton Abbey. 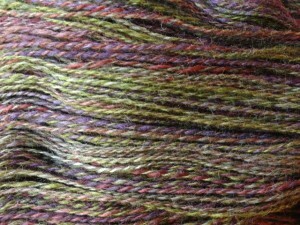 I separated the fiber into piles of like color before spinning, and held the yarn double while weaving. In this photo, the fringe has yet to be cut. Three uses for lemons: 1) Combine the entire grated rind and all the juice of one lemon with roasted, peeled eggplant and some salt for a tremendous tapenade. 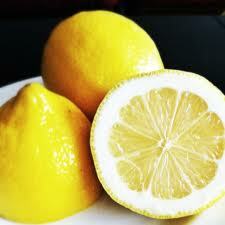 2) Soak thinly sliced onions or shallots (or garlic) in lemon juice for 15 minutes before adding them to a summer salad. 3) Marinate a lamb steak with the grated rind and juice of one lemon, salt, a splash of olive oil, and a handful of fresh chopped rosemary. Grill to medium rare. Let rest for 10 minutes before slicing into thin strips.